It's the cult of protestant-personality versus Christ. Saying 'Godspeed' to satan and placing a wet cloth on the brow of his victims is cause for Novus Ordo Ain't hood. And a bunch of "Ain'ts" they've produced since 1964! All Frankie and his Modernist ilk want is the approval of the world. That's how the false prophets were treated. In all due respect,the much revered Pius XII praised the United Nations as a great hope for mankind in 1956. (I know,he was sick,etc. )My point is the apostasy was well under way by 1951 with the destruction of the Easter Vigil. I too hope "Mother" is in Heaven.One thing is certain,she wasn't Catholic. No, she wasn't. 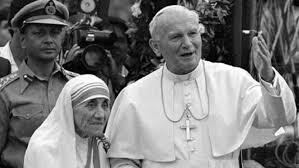 Humanitarian deeds without the true Faith does not make one a "saint." If that were the case, there are many Protestant missionaries who helped the poor, so why not make them "saints" too? Merry Christmas to you & your family. Love & blessings to all. Thank you! The Blessing of the Holy Family on this Christmas to your family and you. You're in my prayers. What is your opinion on catholic Internet forums? They have their place. They get people talking and thinking on various topics. I would, however, be cautious. There are people who write things that are not orthodox and like controversy for the sake of controversy. Those not well-informed and strong in the Faith would do well to avoid them.